The Independent High Authority for Elections (Arabic: الهيئة العليا المستقلة للانتخابات‎‎ al-Hay’a al-‘Ulyā al-Mustaqilla lil-’Intikhābāt, French: Instance supérieure indépendante pour les élections or ISIE pronounced: [iˈzi]) is a government agency in charge of organizing and supervising elections and referendums in Tunisia. 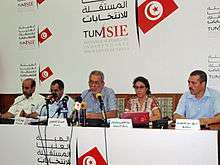 ↑ "Elections in Tunisia: Selection of the New Independent High Authority for Elections" (PDF). International Foundation for Electoral Systems. 24 January 2014. Retrieved 23 November 2014.